Philip Berg has been Master of the Music at The Queen’s Chapel of the Savoy since 1995, and has conducted the choir for many Royal Visits. 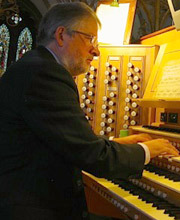 He has given a yearly Bach Recital at the Chapel since 1995, and is near completion of a long-term project to perform Bach’s complete organ works. He has performed at many other venues, most recently at the cathedrals of Inverness, Worcester and St Giles, Edinburgh, and has been heard as accompanist on BBC radio. He is Director of Music at St Paul’s Preparatory School (Colet Court), where he has taught for over 25 years.